Its (mostly) orange-hued transparence has evocatively preserved long-extinct animals for millions of years. It's adorned our necklaces, bracelets, and pendants for millennia. Learn 15 dazzling facts about this clearly sublime substance. 1. AMBER IS A GEM—BUT NOT A GEMSTONE. Amber is not a mineral, but the hardened resin of certain trees fossilized over long periods of time. Because it forms a translucent orange-yellow substance that glows when polished and held up to light, it has long been used in jewelry and other decorations. The proper classification for organic gems like coral, pearl, and amber is gem material, not gemstone. 2. THE LARGEST AMBER DEPOSITS IN THE WORLD ARE IN THE BALTIC REGION. A botanical paper published by The Royal Society estimates that over 105 tons of Baltic amber were produced by Palaeogene forests in northern Europe, making this the largest single known deposit of fossilized plant resin. Baltic amber is also considered the highest quality, with the best preservation of anatomical detail of fossil insects of any age. 3. AMBER WAS ONCE PART OF A TREE'S IMMUNE SYSTEM. When a tree is punctured or scratched, the tree releases a sticky substance called resin to seal the wounded area. Over time, chemically stable kinds of resin will harden and form the pretty, translucent version of amber that you are familiar with. Thus amber is the hardened, stable resin of ancient trees. 4. IT REQUIRES MILLIONS OF YEARS AND PROPER BURIAL CONDITIONS TO FORM. Most forms of resin are chemically unstable and will decay over time rather than harden. When a stable resin gets buried in the right conditions, such as in water sediments that formed the bottom of a lagoon or delta, sedimentary clay, shale, and sandstones associated with layers of lignite, a brown coal, it hardens through "progressive oxidation and polymerization of the original organic compounds, oxygenated hydrocarbons," according to Emporia State University's Susie Ward Aber. The majority of amber is found within Cretaceous and Paleogene sedimentary rocks (approximately 30 to 90 million years old). 5. THE WORD ELECTRICITY DERIVES FROM THE GREEK WORD FOR AMBER. 6. MANY CREATURES HAVE BEEN TRAPPED IN AMBER—AND SO HAS A DINOSAUR "FEATHER." Lots of creatures have ended their lives fully intact in amber. Frogs, Anolis lizards, and geckos, as well as snake skins, bird feathers, the hair and bones of mammals, and various plant materials have been preserved in amber. More than half the inclusions found in amber are flies, while others include ants, beetles, moths, spiders, centipedes, termites, gnats, bees, cockroaches, grasshoppers and fleas. Fine Baltic amber from Estonia, however, will have only one inclusion in every thousand pieces found. One of the more exciting inclusions was the discovery of what scientists say may be the “feather” of a theropod dinosaur. 7. SCIENTISTS HAVE TRIED TO EXTRACT DNA FROM INSECTS TRAPPED WITHIN IT. Despite the success of the movie franchise Jurassic Park, in which fictional scientists reanimate dinosaurs from DNA trapped in amber, real scientists have not successfully extracted functioning DNA from insects trapped in amber, though they haven’t given up trying. (Reports from the early 1990s of 120-million-year-old insect DNA have been thoroughly discounted.) DNA, it turns out, has a half-life of 521 years. That means in 521 years, half of the bonds between nucleotides in a DNA sample will have broken; after another 521 years half of the remaining bonds would have gone; and so on. 8. 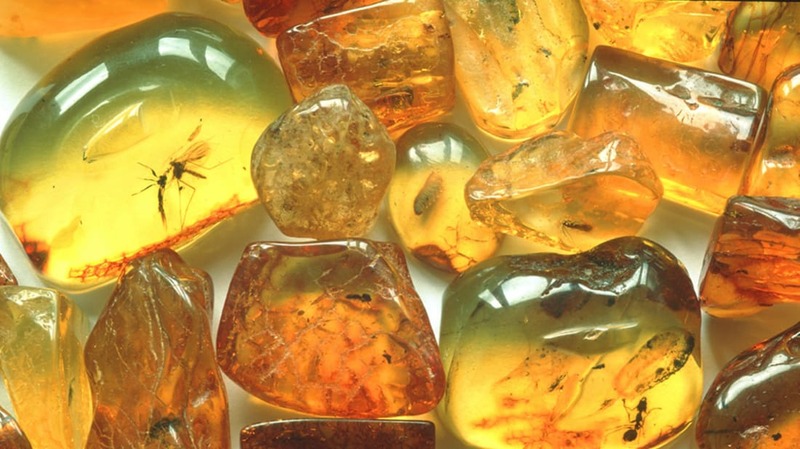 MULTIPLE EXTINCT SPECIES HAVE BEEN IDENTIFIED THANKS TO AMBER. Because of the unique way that amber traps and preserves insects and animals inside it, these finds have helped paleontologists to reconstruct life on earth in its early origins, and more than 1000 extinct species of insects have been identified as a result of amber. 9. BALTIC AMBER HAS BEEN FOUND IN EGYPTIAN TOMBS. The Ancient Egyptians really liked amber; there are many reports of amber and other similar resin products being found in tombs dating back to 3200 BCE. Some scholars think that these resins were intended to represent the “tears of Ra.” Whatever the significance, the origin of some of this amber is believed to have been the Baltic Coast, more than 1500 miles away. 10. SOME BELIEVE AMBER HAS HEALING POWERS AND THE POWER TO WARD OFF WITCHES. Much folklore exists around the “powers” of amber through the ages. Before modern medicine, amber was worn as a necklace or charm, or carried around in small bags, as a remedy against gout, rheumatism, sore throats, toothache, and stomachache. In fact, some modern parents still purchase their children Baltic amber necklaces with the belief that it helps prevent the pain of teething. While no science confirms that it relieves pain, there is a small amount of research suggesting that succinic acid, which is found in Baltic amber, may be beneficial. However, most doctors are dubious of the claims there is enough acid in a necklace to have any effect, or that it can be released from amber into the skin. It was also believed that amber could help labor progress, and protect against snakebites, or that it contained powerful magic protection against evil forces and witchcraft. 11. HUMANS HAVE USED AMBER IN JEWELRY SINCE AT LEAST 11,000 BCE. Amber which was polished and carved to make jewelry or decorations dating back to 11,000 BCE. has been found at archeological sites in England. It was used to make varnish as long ago as 250 BCE and powdered amber was used in incense. 12. THE OLDEST AMBER IS 320 MILLION YEARS OLD. The vast majority of amber is younger than 90 million years old, but there are examples which are much older. In 2009, researchers discovered a 320-million-year-old piece of amber in an Illinois coal mine, which unexpectedly was very similar to more modern resins. This discovery completely upended the entire early evolutionary history of plants and showed resins were much older than was previously thought. The oldest animals found trapped in amber date from the Triassic, around 90 million years later. Despite being 230 million years old, these mites preserved in the amber are strikingly similar to today’s gall mites. 13. AMBER CONFUSED EARLY HUMANS. According to Judith Frondel, author of the book Amber Facts and Fancies, early modern humans, unsure what to make of these yellow glimmers that often washed up on shore, believed amber to be consolidated lynx urine, sunlight solidifying on ocean waves, or tears of birds from India. 14. AMBER HAS BEEN FOUND IN MORE THAN 300 COLORS. The most commonly admired colors of amber are in the yellow to orange range, but it has been cataloged in as many as 300 colors, even leaning toward green or blue due to the inclusion of plant material. 15. IT'S EASY TO BE FOOLED BY FAKE AMBER. The advent of the plastic known as Bakelite made it possible to create fake, but realistic looking, “amber.” To determine if amber is real, scrape it with a knife. Fake amber flakes, real amber is powdery. Real amber should also float in salt water, and will warm up quickly in your hand.